Sikh temples in Manchester are offering shelter to those affected by the deadly terrorist bombing at an Ariana Grande concert on Monday. The four nearby Gurdwaras – Sri Guru Gobind Singh Gurdwara Educational and Cultural Centre, Gurdwara Sri Guru Harkrisham Sahib, Dasmesh Sikh Temple and Central Gurdwara Manchester Gurudwaras – all kept their doors open for victims through the night. “Sikh Temples in Manchester, UK offering food & accommodation. They are open for ALL people,” said Harjinder Kukreja in a Tweet, posting the address of Sikh temples located in the area. Many other local people took to Twitter to offer those affected beds for the night, using the hastag #RoomForManchester. Taxi drivers offered free lifts, and several hotels and venues in the city centre were also reported to be offering space for those stranded in the city centre. 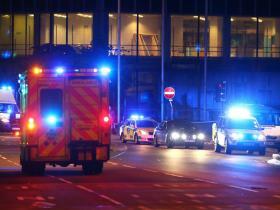 In what was described as the most deadly terror attack the UK has ever faced, at least 22 people were killed after a male suicide bomber targeted music fans at the Manchester Arena. At least 59 people were also injured in the blast, when the attacker detonated an improvised explosive device, shortly after Grande had finished her stage performance. Sir Richard Leese, leader of Manchester City Council, said: “This is an absolutely horrifying incident and our thoughts are with everyone affected, especially those who have lost loved ones or been injured and traumatised. “If it is confirmed this was a terrorist attack it is a monstrous act but also a deeply futile one.